Biscuits are my downfall. As much as I like cake, I think everyone knows that two slices or two cupcakes is rather greedy and will be frowned upon. Biscuits on the other hand…when do you stop? Especially as an avid tea drinker: tea and biscuits belong together, and it’s perilously easy to just continue nibbling or dunking as you drink without really paying attention, until suddenly the packet is almost empty. Anyone who loves sandwich biscuits is doubly doomed: I might think to myself quite contentedly ‘Oh, I only had 3 biscuits with my brew, well done me!’, but actually that’s 6 biscuits, sandwiched together with some creamy goodness. Very dangerous. So, to avoid temptation, I never buy biscuits (except for my emergency packet of Digestives, because they are both comforting and medicinal when I’m ill or troubled). But I do make them. 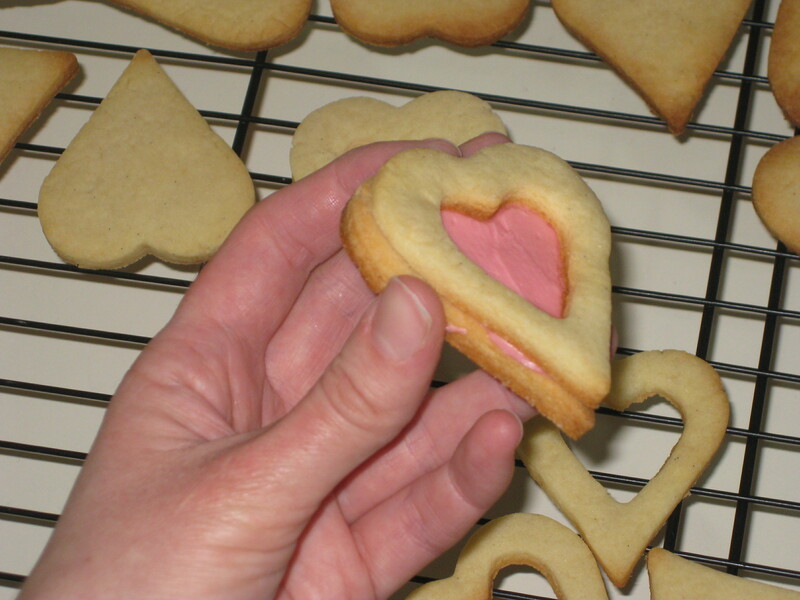 These biscuits were a total afterthought, just a means of using up the buttercream leftover from my rose cupcakes. 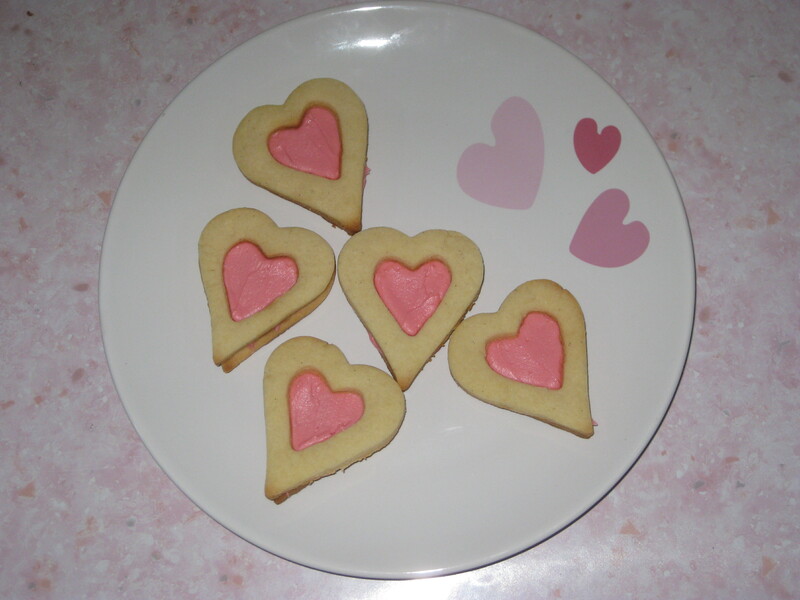 The bright pink icing reminded me of a picture of multi-coloured sandwich biscuits in a cookbook I used to flick through as a child, and I thought the heart shapes were absolutely ideal for this time of year. All in all, a very beautiful (and delicious) afterthought! And as it’s almost Valentine’s Day it seems appropriate to share them, rather than being as gluttonous as usual! 1. Make up the dough as per the original instructions, until it has chilled in the fridge for 30 minutes. 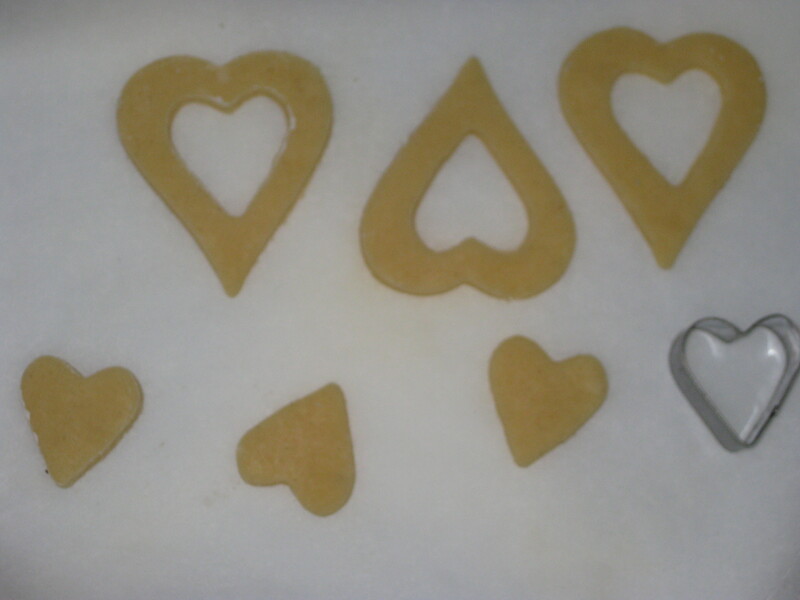 Then on a lightly floured surface roll it out and stamp out heart shapes. Transfer them to baking trays lined with greaseproof paper. 2. 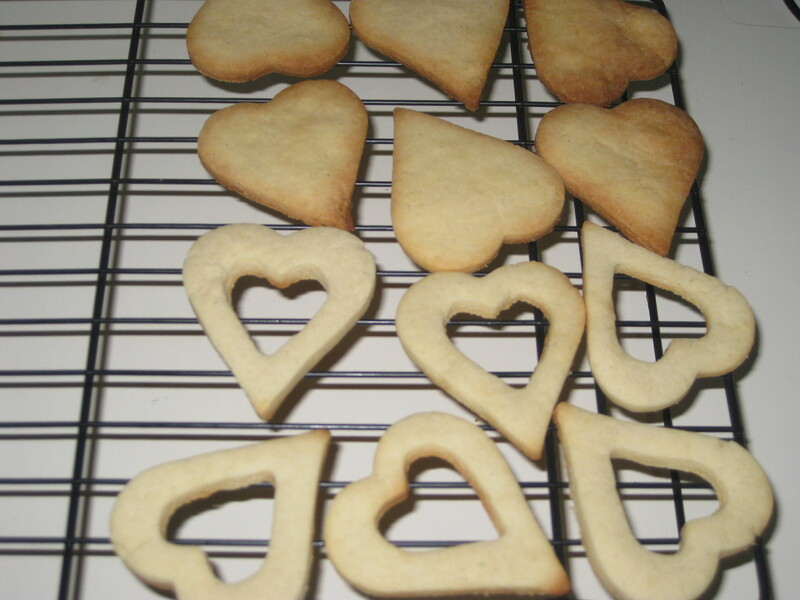 With half of the biscuits, stamp out a smaller heart shape from the middle. 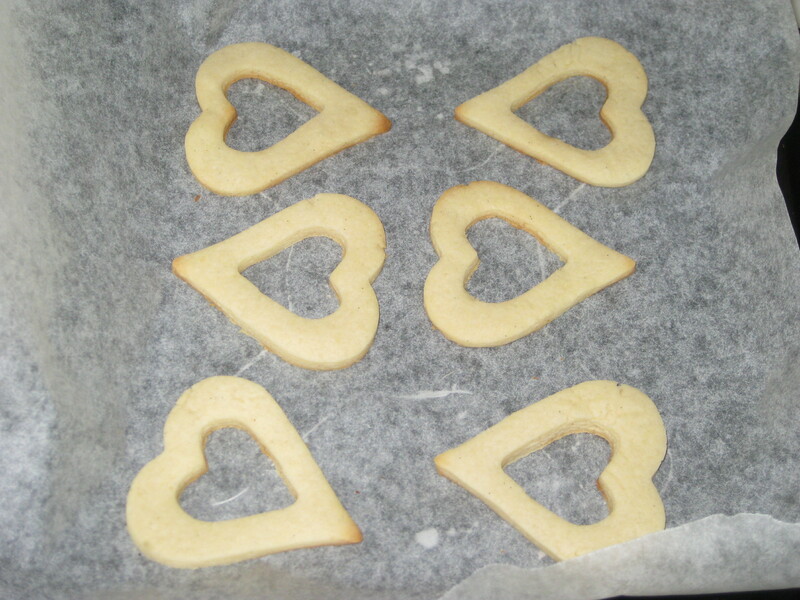 (You can re-roll the trimmings, as I did, or just bake some nice little heart biscuits as well.) Chill all the shapes in the fridge for 15 minutes while you preheat the oven. 3. Bake the biscuits for 9-12 minutes, until they are just turning golden brown at the edges. 4. Stand on the tray for 1 minute, then transfer to a wire rack to cool completely. 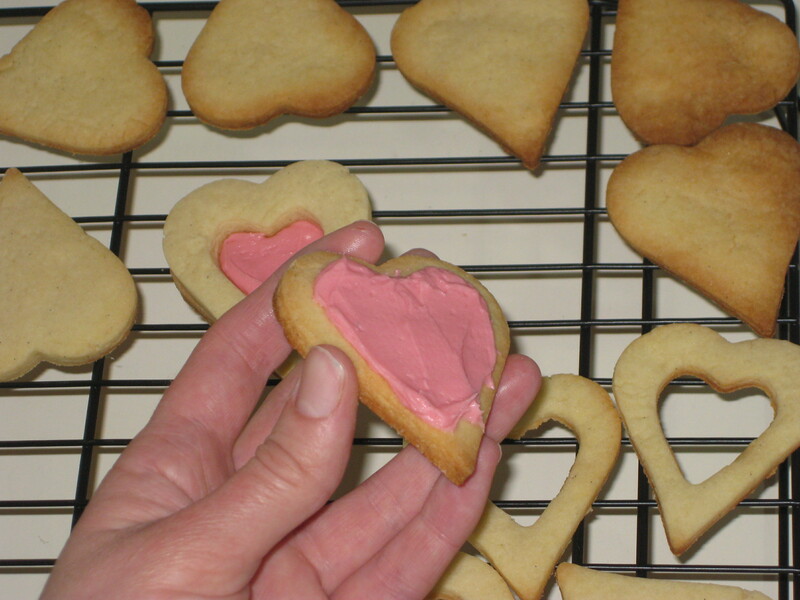 In the meantime you can make the rose buttercream, following the recipe provided. 5. 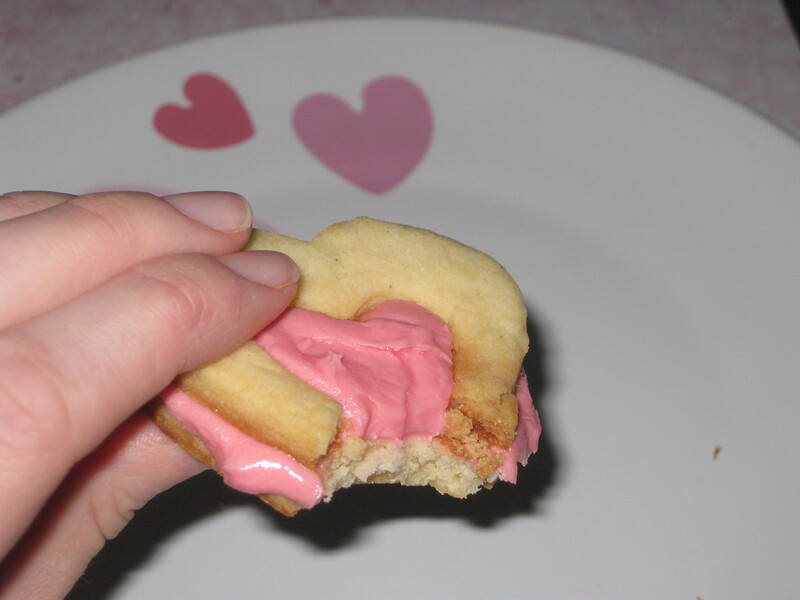 Spread some rose buttercream onto one of the full heart biscuits – some of them I spread quite thinly as above and they looked very attractive, others I slapped it on and they oozed out deliciously. 6. 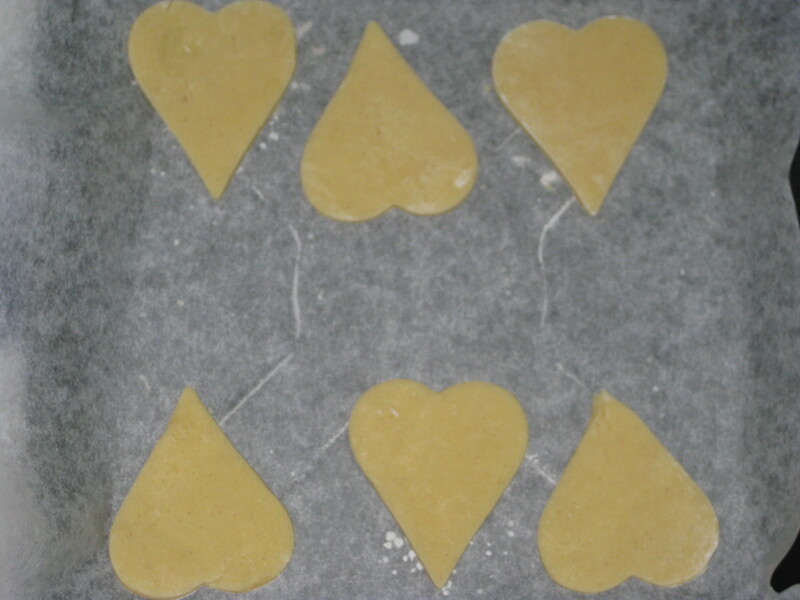 Gently press one of the cut-out heart shapes on top. 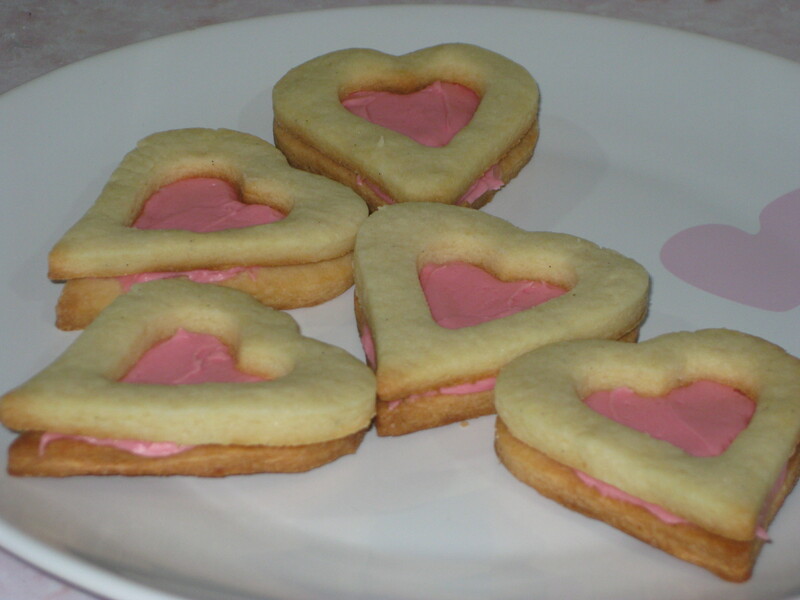 This entry was posted in Vegetarian Recipes and tagged rose and vanilla, rose and vanilla heart sandwich biscuits, Valentine's baking, Valentine's Day cookies. Bookmark the permalink.